The Helical Parallel Gearmotors ITS are for industrial applications with particularly heavy loads. Their robust cast iron housings and highly modular different input and output kits mean they are suited to all types of application. 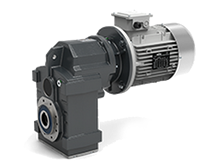 The ITS shaft-mounted gearbox series is made with two types of frame. They are universal, with foot and side flat gasket ring on one side only, or pendant, without feet and with side flat gasket ring on one side only. 3 sizes: ITS 922/3 – ITS 932/3 – ITS 942/3. Transmittable torques are: 1100 Nm, 1700 Nm and 3200 Nm respectively. If you would like to learn more or enquire about ITS Helical Parallel Gearmotors please get in contact via the form below and a member of our team will be in touch.